Dhaka, Mar 27 (Just News): BNP today walked up to Home Minister Asaduzzaman Khan to secure permission for a rally on March 29 that will press for release of BNP Chairperson Begum Khaleda Zia. The party’s standing committee member Nazrul Islam Khan led a delegation to the ministry this morning. Altaf Hossain Chowdhury and Maj (retd.) Hafiz Uddin Ahmed accompanied him. 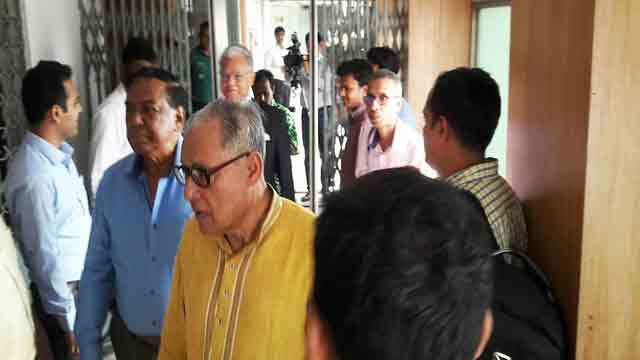 Last reported, the trio met Home Minister Asaduzzaman Khan at his Secretariat office for about one and half hours. After emerging from the meeting, Nazrul Islam told reporters that “the meeting took place in a cordial atmosphere” and that they have received assurance from the home minister in this regard. Previously, the party sent letters to the Dhaka Metropolitan Police Commissioner and Public Works Department seeking permission for holding rally in the capital but it got denied by authorities concerned. Also, before that, BNP have continuously been denied permission to hold mass gatherings at outdoors. Some of their peaceful protest programmes have been foiled by police. Khaleda Zia was convicted in Zia Orphanage Trust case on February 8 by a special court in Dhaka. She landed in jail after she was sentenced to five years' imprisonment in the case. Soon after her conviction, BNP kept on announcing countrywide demonstrations demanding the release of its chairperson.